Kids Program Extended All Year Long! 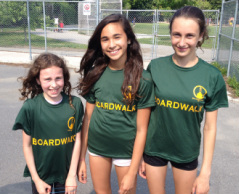 Last year the Boardwalk RC started a pilot project to get more youth involved in track and field. This year it's back and better then before. Club shirts have arrived, Athletics Canada accreditation received, track meets are set up, coaches have planned workouts, everything is underway. All thats left is the running! Sign up for a year, 4 months, or a 1 month pass! A favourite race of the Boardwalk running crew. This years edition boasted 1500 entrants, and provided another year of great results, times and a boatload of hardware that almost sunk the ferry on the return trip from the island! *5K results have been adjusted from original to include runners from team category. 12 yr old Bantam Cameron Woo runs 39:08 at Sporting Life 10Km! Bantam Boardwalk RC athlete Cameron Woo has been on a roll of late. He broke the 20 min. barrier in the 5k in April at the Beaches Spring Sprint for the first time in his career, then he followed that effort up with a 4th place overall finish at the Game of Life 10k. Today, Cameron has conquered another barrier by running under 40 min in the Sporting Life 10k. Cameron is excited to continue training this summer with the club, and list lowering his 1500m time this summer as his main goal. Team Semes takes down Team Duff! Seeing as it is on our home turf, the Boardwalk, most members of the club competed at the 26th annual Beaches Spring Sprint. Keeping with Tradition, the Boardwalk Rc split their team in two. Team Duff squared off against team Semes. Teams were divided by the master himself, Al Baigent (who never seems to be on a losing team). Team Semes won this years battle led by fast newcomer Jason Skilacorn in 17:18, results can be found here.